Soft imitation suede cord cut to your length (in multiples of 1m units). This cord is so soft, you can knot it, tie it, use it with the sterling endcaps or whatever, it will look really pretty for bracelets and necklaces; we have chosen imitation suede because it does not smell like leather and is more ethically acceptable to many jewellery makers and customers. Approx 1 metre 3mm Black Suede Cord. 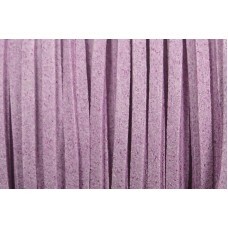 Pre cut to approx 1 metre..
1m 3mm Mauve Suede Cord. Sold from the spool in continuous lengths. ..
1 metre of 3mm Simulated Suede Burgundy Wine sold from a reel so you can have as many continuous m..
1 metre 3mm Black Suede Cord. Sold off the reel so you can have as many continuous metres as you nee..
1 metre of 3mm Pink Suede Cord precut lengths instant stringing in a pretty colour. Sold off the ree..
1 metre of 3mm Simulated Suede Rust lovely caramelised orange colour sold from a reel so you can ..
1 metre of 3mm Simulated Suede Olive sold from a reel so you can have as many continuous metres as y..
1 metre of 3mm Simulated Suede Shocking Pink sold from a reel so you can have as many continuous m..
1 metre of 3mm Simulated Suede Claret Red sold from a reel so you can have as many continuous metr..
1 metre 3mm Bitter Chocolate soft Suede Cord. Sold off the reel so you can have as many continuous m..
1 metre of 3mm Simulated Suede Peachy very soft pretty peach colour perfect for summer sold from ..
1m 3mm Blue Suede Cord soft blue colour. ..